Iran is in the process of starting another Moudge class vessel, its fifth in the series, despite making little progress fitting out the Sahand — another Moudge class launched at Bander Abbas in September 2012. In spite of sanctions, Iran’s shipbuilding industry keeps barreling along with new boats popping up on satellite imagery more frequently. This increasing efficiency has been most notable with the construction of the Moudge class vessels whose numbers will soon reach five, if all goes according to plan. Recent glimpses from open source imagery acquired by DigitalGlobe have confirmed that Iran began construction on the fifth Moudge Class vessel at Bander Abbas, home of the IRIN’s First Naval Region. Utilizing a modular shipbuilding approach, the vessel is shown in four sections (above) near Iran’s recently emptied dry dock. (Cranes are located on tracks nearby to load the modules into the dry dock for assembly). 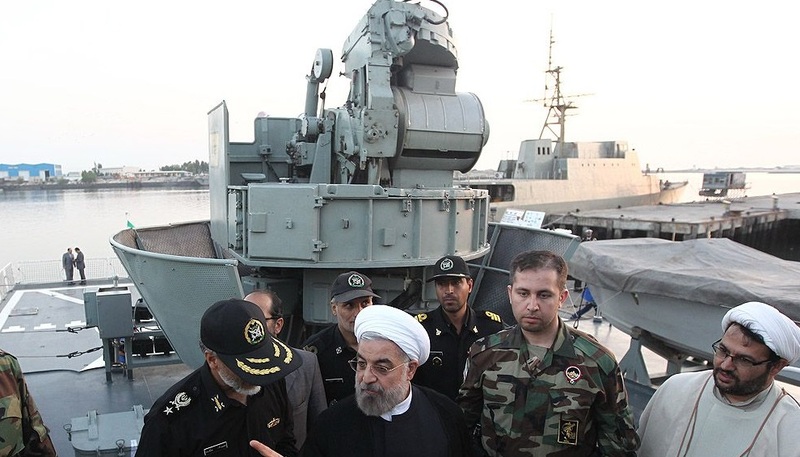 The imagery was released on the heels of a late-February visit by Iranian President Hassan Rouhani who was briefed on the progress of fitting out Iran’s third Moudge, the Sahand. The Sahand has been described by the Iranian press as the fifth Moudge, it will be the third Moudge-class completed, after the Jamaran (2010) and Damavand/Velayat (2013), located at Bander Abbas and Bander Anzali, respectively. (Bander Anzali is located on the Caspian). 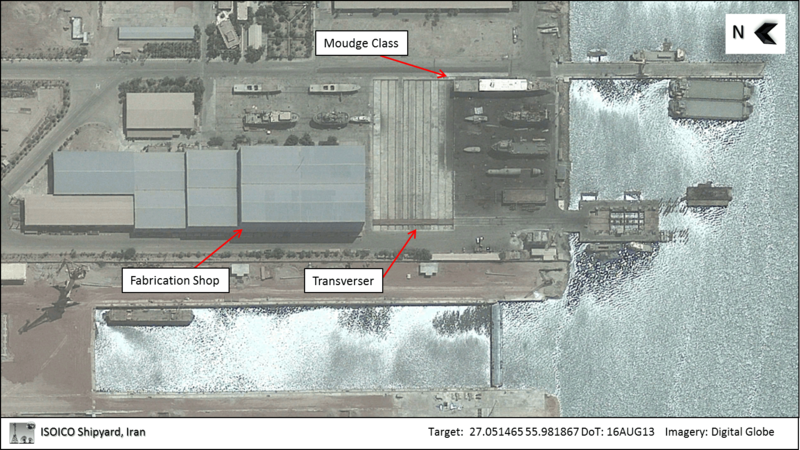 The fourth Moudge class was spotted last year in imagery from August 2013 at the Iran Shipbuilding & Offshore Industries Complex (ISOICO) shipyard. Handheld video documenting Iranian military achievements published on Youtube in early February also confirmed the build. A section of the video showcasing the launch of the Fateh managed to capture the fourth Moudge class located in the adjacent bay at the same fabrication shop in Bostanu. Subsequent satellite imagery no longer shows the vessel near the transverser suggesting that it is back inside the fabrication shop. Iran’s Moudge class are thought to be based on the older Alvand class (Vosper Mk 5). The vessels measure approximately 94 m in length, displace around 1500 tons, and feature a helicopter flight deck. Armaments include a 76mm gun forward and a 40mm gun aft, torpedoes, and four Chinese C-802 surface-to-surface missiles. While handheld and satellite imagery suggest these vessels have started coming together more quickly, fitting them out with sensors and armaments has come at a slower pace. This entry was posted in Armed Forces, Chris B, English, Intelligence, International, Iran, Sea Powers.